I was, at first, a little surprised that I was not familiar with this “Agatha Raisin Mystery” series. Not because I’m a big mystery reader, but because this is the 24th installment in the series! Any book, with that kind of track record is generally something I am aware of. Now that I’ve read a book, I understand a little better why it is that I was not familiar with the series. It feels very formulaic and the attempt to make a very ordinary-but-brassy woman detective comes off as a caricature pastiche. Not knowing Agatha Raisin from her previous books, I was a little befuddled just as to who Agatha is (was?). First, it’s a great name. It provides a wonderful image of a wrinkle-faced, shrivelled-up older woman, though she appears to be quite capable and energetic. Oh yes, definitely energetic. Her energy was actually quite confusing, and for an older woman she managed to take a physical pounding. At one point she’s running after someone in the woods and “Agatha stumbled after him, caught her foot in a tree root and fell flat.” And then it’s as if it didn’t happen as she gets up and continues on. Much later in the book, someone “swung one of her sticks and brought it down on Agatha’s head. Agatha fell to the floor. … (a person) seized Agatha by the ankles and began to drag her towards the kitchen.” When I read this last moment I just shook my head at how much physical abuse this woman took and yet just gets up and continues on. She just never seemed real. The plot is pretty straightforward. A friendly, but not well-respected woman, new to town and either a kleptomaniac or incredibly forgetful, is murdered by poisoning and a local clergyman, not wanting the town to fall in to a bad reputation, hires Agatha to solve the who-dunnit. The entire town population appears to be a potential suspect and everyone points a finger at everyone else, leading Agatha on a merry chase, though it seemed pretty evident who the murderer was going to be, but the false leads seemed part of that ‘formulaic’ sense I mentioned earlier. All in all, it was a bit dull. Perhaps one has to know Agatha a little better from one of her 20+ other books to appreciate her because she never really stood out to this new reader, and the mystery itself couldn’t have been simpler. This strikes me as very classic beach-reading material. Just enough story and character to catch your interest, but not so much plot or character-building so that you can put the book down at a moment’s notice. Looking for a good book? 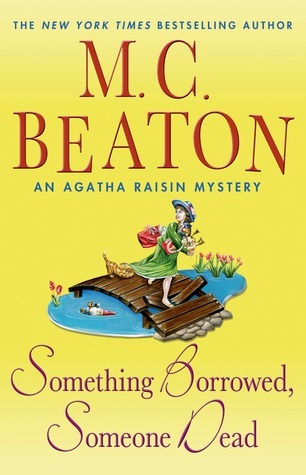 Something Borrowed, Someone Dead is not recommended to readers new to the Agatha Raisin series, and ardent fans don’t need a review to help them decided whether or not to pick up this next installment.